In 2014, Apple management surprised many by announcing they were not going to disclose Apple Watch unit sales once the product went on sale the following year. The decision was interpreted by many outsiders as Apple not thinking too highly of Watch’s prospects. As it turned out, nothing could have been further from the truth. Apple’s Watch disclosure decision ended up foreshadowing management’s recent announcement that it will no longer disclose iPhone, iPad, or Mac unit sales. While a number of factors are behind Apple’s decision, the simplest explanation for the disclosure change is that Apple outgrew unit sales. Unit sales data for iPhone, iPad, and Mac will no longer be provided. Gross margin data will begin to be broken out by services and products (i.e. hardware). Revenue corresponding to the amortization of the deferred value of bundle services (Maps, Siri, and free iCloud) will shift from products to services. The same reclassification will apply to costs associated with delivering the bundled services. The impact from these changes will amount to less than 1% of Apple’s overall revenue. The “Other Products” category will be renamed “Wearables, home, and accessories” to reflect the category’s primary revenue drivers (Apple Watch, AirPods, Apple TV, and HomePod). Not surprisingly, most of the attention flowed to the first item. The thought of Apple no longer disclosing unit sales surprised most people and some went so far as to say Apple wants to hide something really bad in the coming quarters. Others acknowledged Apple made the right decision to move beyond unit sales, although it wasn’t a great development in terms of public company disclosure. Apple management’s decision to no longer disclose unit sales makes plenty of sense. In recent years, it was becoming increasingly clear that unit sales weren’t as useful of a metric for analyzing Apple’s business now as it had been in the past. The primary problem found with unit sales was how the data provided a limited look inside the Apple machine. The one item that for which unit sales continued to prove valuable was deriving average selling prices. However, given the growing impact the gray market is having on Apple’s various product categories, and wider product price ranges, even ASP data has started to lose value in analyzing business fundamentals. Analysts are making a big mistake in claiming Apple’s decision to move away from unit sales means management wants to be more like a services company. Claiming Apple is a services company in 2018 is no different than claiming Apple was a hardware company ten years ago. Both are incorrect. Apple is a design company focused on developing tools for people. These tools allow people to get more out of technology without having technology take over their lives. This mission leads to a simple, but important, realization: Apple has to continuously develop new tools that people want. A question raised by such a mission is how best to measure Apple success and failure. Management is painting a new long-term blueprint for how it wants Wall Street to judge Apple: revenue and margins. By having attention flow not just to revenue but also to gross margins, Apple ends up adding an interesting twist to the financial disclosure debate. Revenue has been one of the most consistent metrics for determining how Apple is doing in the marketplace. Exhibit 1 depicts Apple revenue over the past eight years. 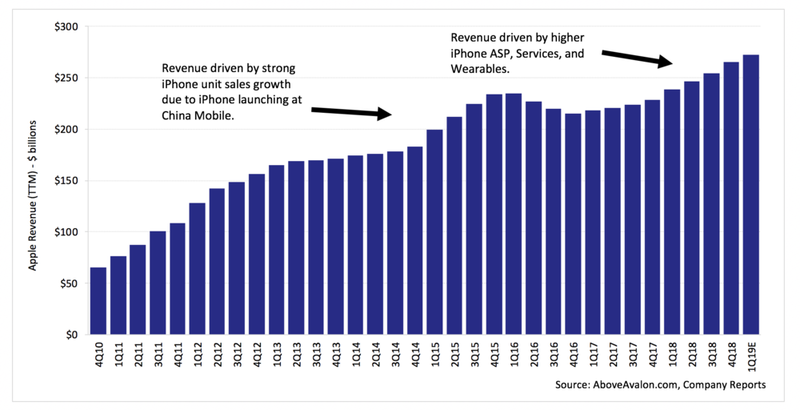 Despite years of unit sales volatility, Apple’s revenue trends have been much smoother. The only hiccup in Apple revenue followed a surge in iPhone revenue in 2014 associated with the iPhone launching at China Mobile. Management will continue to disclose iPhone, iPad, and Mac revenue going forward. It’s difficult to see Apple not eventually disclosing Apple Watch revenue, or at least wearables revenue, as sales continue to grow. However, revenue data by itself is unable to tell the full story. Management could juice near-term revenue by running with lower prices and margins in an attempt to grab market share. Such a move may boost near-term revenue at the expense of problems down the road. Vice-versa, Apple could be generating additional revenue by milking existing customers with excessively high prices and margins. The strategy contains various long-term risks when thinking about the health of the Apple ecosystem. This is where gross margins enter the picture. Gross margin data allows outsiders to dive deeper into Apple revenue. Strong revenue growth combined with steady margins tell us that Apple isn’t chasing market share with unsustainable pricing. Steady gross margins, despite higher-priced products, tell us that Apple isn’t milking existing users of profit, but is instead running with higher prices to reflect additional technology. Gross margins add much-needed context to Apple revenue. Historically, Apple has disclosed one overall gross margin figure for the entire business. Given the lack of disclosure detail, we were only able to reach a few general takeaways about Apple’s gross margins. Given how Apple’s overall gross margins trend between 37% and 39% and iPhone represents such a large portion of the revenue, it’s fair to assume iPhone margins are somewhere around 40%. Based on management commentary, Apple’s Services business has gross margins that exceed the company’s overall margins. This tells us that Services gross margin exceeds 40%. My estimate pegs Services gross margin in the mid-50s. Based on management commentary, Apple Watch gross margins were lower than the company’s overall margins. This tells us Watch margins are somewhere around 25% to 35%. It is a fair assumption that iPad and Mac have a similar margin profile. As shown in Exhibit 2, for the past four years, gross margins have trended within a narrow 200 basis point range. This hasn’t exactly told us a whole lot about the different variables driving gross margins. Based on Apple’s new margin disclosure, management will break out gross margins by hardware and services. Accordingly, we will be able to see whether or not Apple has been running with higher product margins to boost profits or merely to reflect higher component costs. (My suspicion is it’s the latter.) We will also get our first look at Apple’s Services margins which will help decode the various Services revenue growth drivers. In summary, providing more granular gross margin data is a big step forward from a financial disclosure perspective. While it may seem like an exaggeration, trading unit sales data for more granular gross margin data could prove to be more beneficial for analyzing Apple’s business fundamentals. One school of thought regarding Apple’s unit sales disclosure change is that management is gradually moving towards providing completely new metrics such as the number of users in the Apple ecosystem. Apple’s success would then be measured by tracking the total number of users and management’s ability to monetize those users. One way of doing this would be to take Apple revenue and divide the total by the number of users. Presumably, rising revenue per user would be viewed as a good thing, while a declining revenue per user metric would be viewed negatively. However, there are a few issues to consider. It’s not sustainable. Unless Apple changes its pricing philosophy, the company will eventually begin to hit a ceiling when it comes to new user growth. Accordingly, why would Apple management elevate an unsustainable metric, especially since the company is moving away from unit sales given its unsustainable nature. Questions around usefulness. It’s not entirely clear how useful revenue per user actually would prove to be for analyzing Apple. Unless Apple breaks down revenue per user by hardware and services, the overall average won’t tell us much about the various moving parts. Bias towards services over hardware. By focusing on revenue per user, there is an inherent bias to elevate Services revenue given its more predictable and steady nature. The decision to elevate revenue and margins while moving past unit sales is Apple management’s latest attempt to cement a new long-term narrative for the company on Wall Street. People love great stories, and Wall Street is all about narratives. A strong narrative allows a management team to navigate rough waters while a weak narrative may result in depressed valuation multiples. Accordingly, Apple’s inability to find a sustainable narrative has been a thorn in management’s side for years. Apple’s narrative problem was relatively straightforward: The key variables management focused on in earnings releases and conference calls weren’t sustainable. By placing an emphasis on unit sales, the inevitable slowdown in unit sales growth for its largest product categories posed a problem for Apple. Forcing Wall Street to move beyond unit sales and focus on revenue and gross margins isn’t about driving home a Services narrative for AAPL shares. Instead, it’s a big step in elevating a capital allocation narrative. Compelling tools will lead to strong revenue trends and margins, which support attractive free cash flow and consequently more cash for buyback and cash dividends. The opposite is true as well with weaker product sales leading to a reduction in cash flow and less cash for share repurchases and cash dividends. At the heart of this narrative is management's unique philosophy regarding how shareholder capital is used to generate future cash flows. Apple doesn't develop products to drive revenue. Instead, many ideas are passed over to focus on a few really great ideas. A narrative involving Apple's capital strategy rather than any one story based on a particular product like iPhone or Apple Watch will end up doing a better job of describing the company's design story. More importantly, a capital allocation narrative will be able to grow with Apple as the company evolves over time.